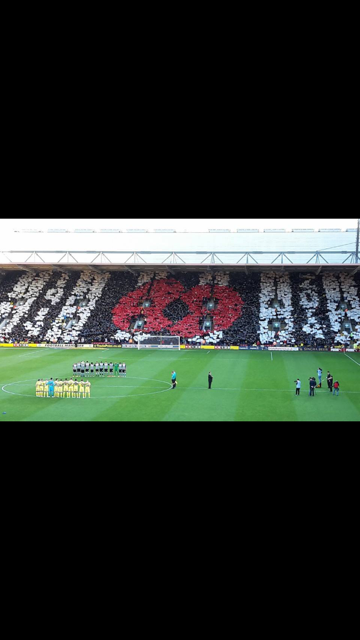 With this being the closest home game to Armistice Day in the 100th year since the start of World War I, the usual commemorations were being supplemented with a foil display organized by the 1881 group and financed by Watford’s players. A crowd turned up at the ground first thing to put the foils out, a job that was completed in double quick time. According to the instructions from the club, we arrived at our seats earlier than usual to find all the usual stragglers were already there and that programmes had sold out. When instructed, we raised our foils and, from our position under the display, could only wonder whether it had been a success. I must admit that the photos were breath-taking and must thank a friend who sits in the Family Stand for providing the wonderful picture shown here. Huge congratulations to Roy Moore and the other lads from 1881 who designed and executed the display. It was a tremendous achievement. On the pitch, the players were to wear the black and white kit from 1914, so Millwall wore their yellow change strip. 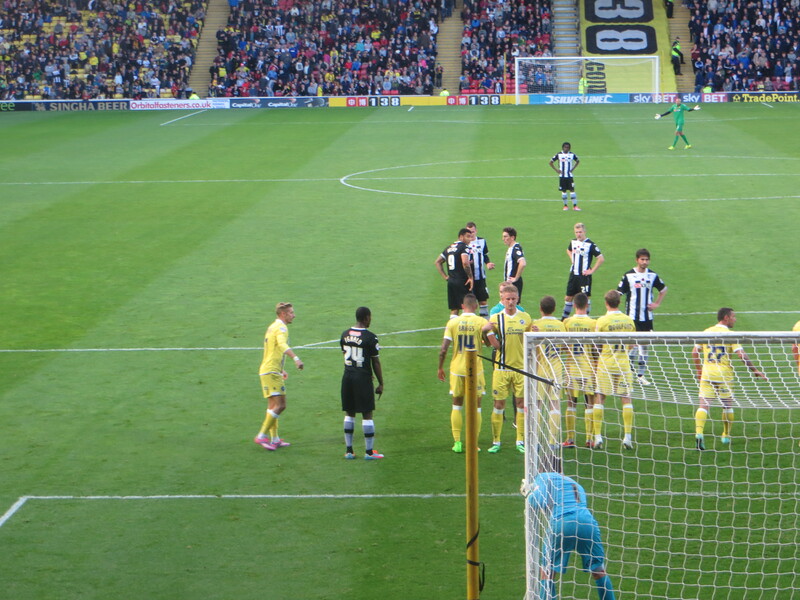 It was very bizarre to see the opposition in yellow at Vicarage Road. Team news was that there were three changes with Gomes and Deeney returning from injury and Andrews in for Anya in midfield, so the starting line-up was Gomes, Pudil, Ekstrand, Bassong, Paredes, Tözsér, Munari, Andrews, Ighalo, Vydra and Deeney. Undistinguished former loanee Matthew Briggs started for the visitors. It should also be mentioned that, now the final seats have been installed in the Community stand, we have a four-sided ground for the first time in many years. It is a wonderful sight to see. The home side dominated the early exchanges, the first goal attempt coming as Deeney and Vydra exchanged passes in the box and Troy hit a shot that Forde dropped to save. At the other end a low cross by Woolford was gathered by Gomes. On 11 minutes, Millwall took the lead as McDonald crossed to Woolford inside the box, he shrugged off Bassong and slotted the ball into the bottom corner. That certainly depressed the mood in the home stands. Watford tried to strike back immediately as Vydra played a through ball to Paredes but his shot rebounded off the post. Millwall’s Dunne went down dramatically after a challenge from Deeney. Watford played on and Dunne leapt to his feet and sprinted back to defend. At the next break in play Forde bafflingly went to remonstrate with the referee and was booked. The next time that the ball went anywhere near the goal was on the half hour when a free-kick from Tözsér flew over the bar. The next action of note was a bizarre challenge by Vydra, who was clearly frustrated as he jumped into Williams. He was fortunate not to be carded. Injury forced an early Watford substitution as Bassong made way for Hoban. An attempted break by Ighalo was stopped by a push from Briggs who was shown a yellow card for his trouble. From the free-kick, Ighalo unleashed a shot that was turned around the post by Forde. The resultant corner was straight off the training ground as it was played out to Andrews, who dinked it in to Vydra, running into the box, who got the slightest touch and the ball trickled over the line. 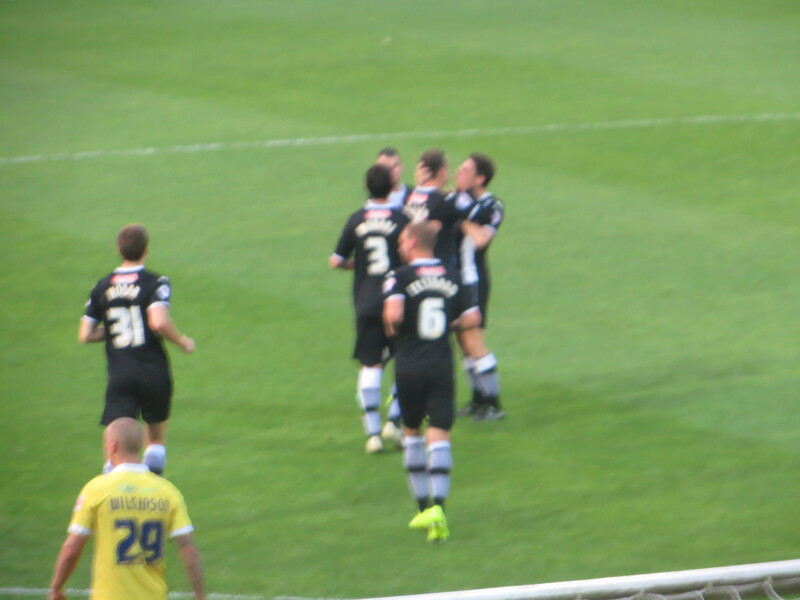 The goal invigorated Matej who next hit a shot from a cut back by Ighalo which was turned just wide. Then, from the corner, he headed just over. For the visitors, Fuller broke into the box and went down under a challenge but the referee was having none of it and the forward was booked for his protests. In time added on at the end of the first half, Dunne bundled Deeney over on the edge of the box and was booked for the offence. Tözsér’s free-kick was a bullet that flew past the wall and into the net. The Millwall keeper, Forde, didn’t move. It had been a strange first half, with a long period when nothing much happened, but it had burst into life at the end and it was great to go into half time a goal to the good. Millwall had the first chance of the second half as Woolford got his head to a corner from Williams but he directed it wide of the target. At the other end, a header from Hoban was saved, but the flag was already up for offside. 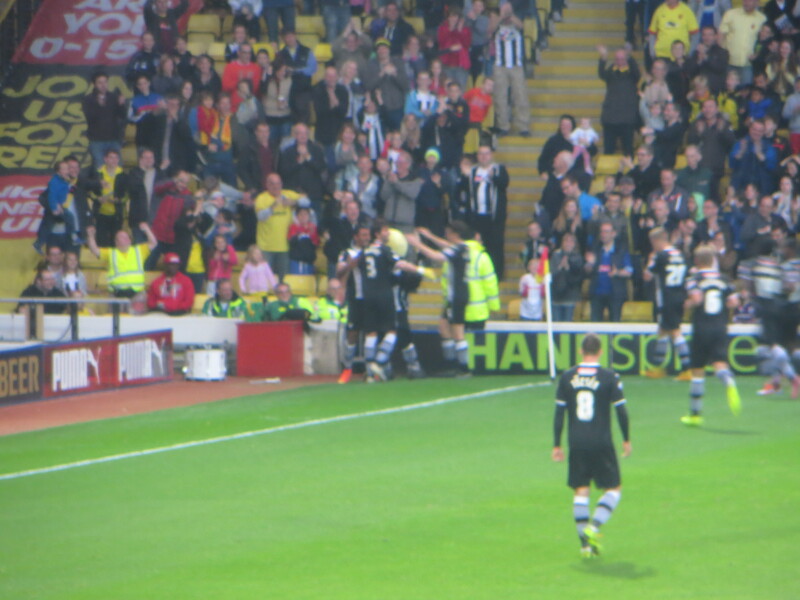 Deeney and Munari exchanged passes then played a through ball for Vydra but Forde was first to the ball. On the hour, Holloway made his first substitution as Briggs was replaced by Malone. Martin tried to break forward but was taken down by Hoban who was booked for the foul. On 63 minutes, Watford increased the lead as, from a free-kick, Vydra cut the ball back to Munari who lashed it past Forde for Watford’s third goal. A frustrated Fuller kicked out at Ekstrand and was lucky not to see a second yellow card so Holloway did the sensible thing and replaced him with Gueye before he got himself sent off. Yet again, it hadn’t been a brilliant performance but we had broken down a well-organized Holloway side and, once we’d got the third goal had never been in any danger. We all agreed that sometimes you have to win ugly. It is far too early in the season and far too tight at the top of the Championship to get too excited, but we are now none games unbeaten and the signs are all good for an exciting season. This entry was posted in Watford FC and tagged Aiden O'Brien, Alan Dunne, Andy Wilkinson, Byron Webster, Daniel Pudil, Daniel Tozser, David Forde, Ed Upson, Gianni Munari, Heurelho Gomes, Ian Holloway, Joel Ekstrand, Juan Carlos Paredes, Keith Andrews, Lee Martin, Lloyd Doyley, LLoyd Dyer, Magaye Gueye, Martyn Woolford, Matej Vydra, Matthew Briggs, Millwall FC, Odion Ighalo, Ricardo Fuller, Scott Malone, Scott McDonald, Sebastien Bassong, Shaun Williams, Slavisa Jokanovic, Tommie Hoban, Troy Deeney, Watford FC on November 2, 2014 by franelynn.